The Takenouchi manuscripts are a set of mysterious documents that were rewritten by a man named Takenouchino Matori 1,500 years ago in a mixture of Japanese and Chinese characters, transcribed from even older texts. According to legend, the original documents were written in divine characters many millennia ago by ‘the gods’. The unusual texts tell a story of humanity in a way that has never been told before, starting from the beginning of creation up until the emergence of Christianity. They talk of an era in our ancient past where mankind lived in peace and harmony, united under the rule of the son of a Supreme God. The Takenouchi documents are said to be preserved by the Takenouchi family, descendants of Takenouchino Matori, son of the legendary Japanese hero Takenouchi no Sukune . According to Yamane Kiku in his book “The Authentic History of the World Secreted Away in Japan”, the original manuscripts were handed down from generation to generation and kept within the Kosokotaijingu Shrine in Mount Omijin in Toyama Prefecture. The Kanyamato dynasty, which includes 125 generations, starting in 660BC and continuing to this day. In the beginning, the story goes that the world was a sea of mud, which took 22 billion years to form. The first God and Goddesses emerged, the heavens and the Earth were separated and the Sun and Moon were created. Gradually, Earth took form during a period of 6 generations. In the fifth generation, the Gods gave birth to the Creator of Nations, who descended to Mount Kurai in Japan, dressed in a ‘shiny’ body. During the period of the seventh generation, various beings developed technologies including transportation and writing, weather control, farming technology and computers. This seventh generation started the beginning of the lineage of World Emperors starting with Sumera-Mikoto, an ancient Japanese word. The Takenouchi documents refer to the Sumera-Mikoto as the ‘Son of the Sun’, since he descended from the Sun God. The children of the Sun God started the High Ancient Dynasty and after 8 billion years, their sons and daughters were sent all over the world to start their own nations. In the Takenouchi documents, the account of human creation does not follow the path of evolution. Rather, it was the Gods that created humans, and the sons of Gods created five types of coloured people (white, red, blue, yellow and black) and scattered them all over the Earth. 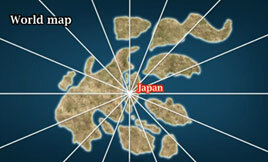 Japan became the centre of the world, from where the Gods created races and dispersed them outwards. The Koto Era was the womb of the creation of a unified world government under the reign of the first god emperor, the Sumera-Mikoto. Sumera-Mikoto divided the world into 16 regions with Japan at its centre, appointing a king to rule over each region. The crest off the Sumera-Mikoto, the 16 petal chrysanthemum, symbolizes the world and its 16 regions. This crest, known today as the Chrysanthemum Flower Seal is still used today as the Imperial Seal of Japan, a crest used by members of the Japanese Imperial family. 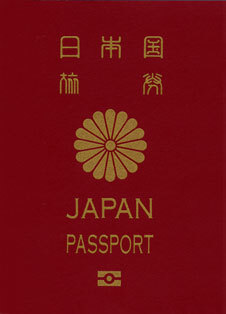 Under the Meiji Constitution (1890-1947), no one was permitted to use the Imperial Seal except the Emperor of Japan. But the 16 petal chrysanthemum has not only been used in Japan. 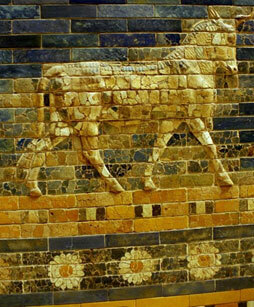 It was also present on the Ishtar Gate of Babylon (a reconstruction using original bricks is now shown in the Pergamon Museum, Berlin), at the Alhambra Palace in Spain, and at various locations in Rome, Egypt, and elsewhere. Is it a coincidence, or is there an ancient connection? According to the Takenouchi manuscripts, the seat of this world government was located in the Hida Mountains in Japan. The Kosokotaijingu Shrine was the most sacred of all, dedicated to the ancestors of mankind. It is said that the shrine was built with a non-rusting metal called hihiiro-kane. According to the Takenouchi documents, all five coloured races of humanity visited the shrine to celebrate in an annual festival. The documents state that Sumera-Mikoto made frequent tours all around the world. He travelled in a flying vessel called Ameno-ukifune (‘floating ships’). The documents tell us that the places that these vessels landed were named ‘hane’ (‘winds’). Many places in Japan have names that include the word ‘hane’. These, according to the Takenouchi documents, were ancient landing sites. Even today, one of the Tokyo airports is called Haneda airport. The ancient social system was based on agriculture. People cultivated the land as farmers of the Sumera-Mikoto. The land was owned by the Gods but administered by the people. Although the land was leased, there was no tax involved. There was no one to control or exploit them. People could enjoy the fruits of their labour. The Sumera-Mikoto aimed to bring happiness to his people, who in return loved and respected him. However, Sumera-Mikoto would decide who would be king of a region and who not, he had the power to add or remove a person based on their governing abilities. This reminds us of the accounts given in the ancient Sumerian texts where the first kings were appointed directly by Gods, while the first kings were the Gods. The Takenouchi documents also refer to pyramids. According to the documents they were either human-made structures or human-moulded hills that Sumera-Mikoto would use to communicate with the heavenly Gods. The texts mention the building of numerous ‘hiramito’ (‘shrines’) for the coming of the sun god. The word ‘pyramid’ is said to be derived from the word ‘hiramito’. 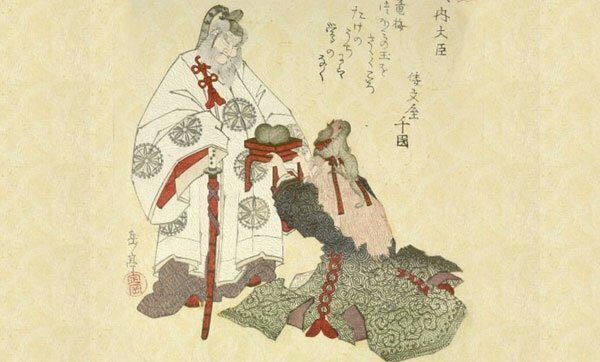 As with many other ancient mythologies, the golden era at some point comes to an end, usually when humans begin to be disobedient to their Gods, and this was the case during the Fukiaezu dynasty, which saw the end of many millennia of peace and prosperity. Catastrophic upheavals caused two continents in the Pacific Ocean, Tamiara and Miyoi, to sink into the sea and at the very end of this Era, an enormous earthquake caused a 200-metre tsunami that devastated Japan. These disasters were brought on by the ‘corruption’ of the human spirit. People forgot Sumera-Mikoto and became arrogant, provoking the wrath of their Gods. One of the most peculiar aspects of the Takenouchi documents is the account of Moses and Jesus, who are both said to have ended up in Japan. Even more surprising is the fact that their supposed tombs can still be visited today. The so-called grave of Jesus (who is said to have lived up to the age of 106), can be found in the remote mountains of northern Japan in a strange little town known as Shingo, in the Aomori Prefecture. The town calls itself Kirisuto no Sato (‘Hometown of Christ’), and just a few minutes’ drive from the centre of town is an 8-foot-high wooden cross surrounded by a white picket fence, which sits on a bluff in the woods overlooking a gravel parking lot. According to the Takenouchi texts, Moses too ended up in Japan where he is said to have lived for 583 years. 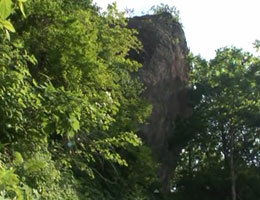 His supposed grave can be found today at the foot of Mount Hodatsu in Ishikawa Prefecture. Trying to unravel the origins and authenticity of the Takenouchi documents is now an impossible task as the original manuscripts were allegedly confiscated by government authorities and later lost. As a result, much speculation has circulated regarding the accuracy, and indeed the agenda, of the Takenouchi texts. According to Ichiro Yamane, grandson of Kiku Yamane, who wrote the book “The Authentic History of the World Secreted Away in Japan”, the Takenouchi Documents were propagandistic documents, written by the Japanese military to justify the Japanese Emperor ruling the world. Remember that according to the Takenouchi documents, humanity started from Japan, and Japan was the centre of the world. In the 19 th century, Kiyomaro Takenouchi founded an offshoot of the Shinto religion based on the Takenouchi documents. Could the manuscripts have been created to give birth to another religion? Today the mainstream opinion is that the Takenouchi documents are nothing more than a hoax, and an elaborate one at that. Others maintain that they may have their roots in truth. However, with the original texts now missing, it is one mystery that will probably never be solved. Featured Image: Takenouchi no Sukune, Japanese, 19th century, Source: Harvard Art Museums. so a 300 billion year old god had nothing better to do than bring harmony to the minds of earthlings...makes a guy wonder if that was before breakfast or did it take clear till supper time? i love how all these ancient stories and just ancient peoples especially "black people" are or were supposed to sooooo harmonius and peaceful and everyone got along,riiiight.It was all unicorns and rainbows and pots of gold for everyone.riiiiight! I don't see it as any different than the attempts at making dark Middle Eastern people white in contemporary Christianity. Interesting how so many cultures have the arrogance of wanting to believe that their country or pedigree is the seat of the world, when none of them really are. History did not start in Japan, just as it did not start in any of the other countries that would like to claim that honor. This history is in the collective unconscious of all the different cultures, so it is similar in the various myths, but it does not belong specifically to only one of them. Humans think in terms of earth only. They are not able to comprehend that many of the myths and legends that are considered to relate to events on earth are actually cosmic stories.....just look up and understand that the Argonauts are the 50 oarsmen of the days Sirius B takes to go around Sirius A, they are in the Egyptian myths, they had Medea a black magician kill Talos who protected Europa on the island of Crete where she had been abandoned by the "bull"....This seems insane, but what we think are stories about events on this earth actually are stories about things beyond this earth, but they are in the collective unconscious of all cultures and all humans. No one culture on earth can claim these myths as their own....they are universal.